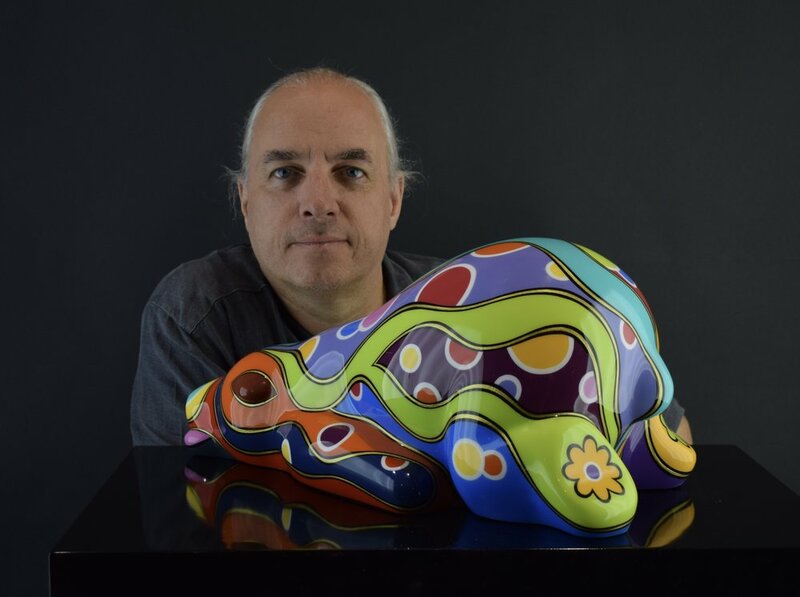 Born in 1965 in Paris, Arnaud Nazare-Aga developed a passion for modern sculpture and architecture since childhood. He was constantly visiting museums with his parents. He was educated in a Tibetan Buddhist community in Burgundy and later became a trained plasterer-molder. Arnaud designed et realized many carved decorations of Buddhist temples in the West, such as the Temple of a Thousand Buddha near Autun (France) and Paris. He worked at the realization of the 3 monumental sculptures of Buddha inside the temple with artists from Bhutan. After many different professional experiences in Europe and Asia, he has founded the PAJ'Art Studio in January 2011 in Bangkok where he’s living. In 2012 Arnaud created, some collections with the collaboration of his ex-wife, under the duo name, Artheline. The collections are known for their fun, brightly-colored and voluptuous Sumo, Hippop’Art, Whale Pop, Goril’Pop and goddess sculptures that bring childlike joy to viewers. In 2015, the Hippop’Art exhibition at the Fullerton precinct in Singapore, where over 40 hippos took over the hotel’s gardens, lobby and the quays outside. His most important art project is making the Little Prince art pieces inspired by the most widely-known French literary work with poetic and philosophical significance, accessible to the blind. Through the sense of touch, the visually impaired are able to "see" his sculptures in a kind of induction to the world of art. The fruits of Arnaud Nazare-Aga's labor were showcased in Singapore presented as part of the French cultural festival, Voilah!. Then this exhibition was setup in Hong Kong where the collection adapted for the visually impaired had 124,000 visitors in 38 days. Then in May 2016 the 2 Little Prince exhibitions were presented in a national museum in South Korea, Gyeonggi Provincial Museum for almost 5 months. The sculptures are presented now in the Singapore Philatelic Museum for 10 months starting on 7th June 2018 until March 2019. One of his latest work is the Sumo Totem: the 3 different Sumo placed on each other. The symbolic is the stability and security for the first one, the open mind for the second and the third one, on top, represents the adventure of the life. Arnaud is about finish the creation of the B’Pop Collection that you can see now in U-Sathorn Hotel Bangkok as a preview before being exposed in Fullerton Singapore in September. B’Pop collection is composed of 3 models of bears in different positions: Dancing B, Sitting B & Lazy B. Each of them is in 5 sizes and several designs. Arnaud Nazare-Aga’s work is presented in many international fairs and galleries in Asia and Europe for the last 7 years. His last main exhibition in 2018 were Art Stage Singapore where he presented a 3,4m high Totem Sumo as Public Artworks, AAF Milan and “Behind the Little Prince” in the Singapore Philatelic Museum.